Free shipping. Buy direct from HP. See customer reviews and comparisons for the Buffalo TeraStation 1200D Desktop 8 TB NAS Hard Drives Included. Upgrades and savings on select products. 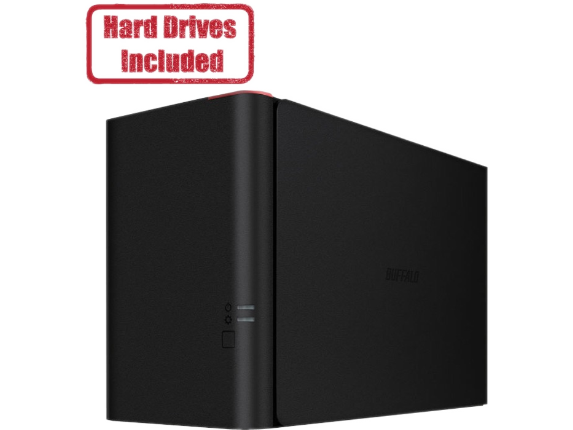 Buffalo's TeraStation 1200D is a compact desktop storage solution with hard drives included ensuring comparability and reliability with your device. This 2-drive storage solution was designed to provide business level software at an entry-level price while providing a personal cloud with multiple user access. Enjoy easy set-up with customizable RAID data protection and exceptional performance during file transfers and everyday NAS functions, as well as professional features such as Active Directory, USB accessory, and disk quota support; share level replication; hot-swap hard drives; and eleven licenses of NovaBACKUP -Buffalo Edition provides professional backup & data recovery solution.